This is a comfortable Oceanfront rental home for vacationers looking for an Outer Banks vacation accommodation. 4 bedrooms (1 with Queen, 2 with Double, 1 with Twins with CATV/DVD player), 2 baths (1 with tub and shower, 1 with shower), living area with wet bar, CATV/DVD player, stereo, additional dining/game table, powder room. Kitchen/dining area and breakfast bar. Central heat and A/C, screened porch, 2 outdoor showers, swimming pool in front of house. 1 bedroom (with Queen), 1 bath, CATV/DVD player, stereo, laundry, electric heat, WINDOW A/C. This vacation rental has a private Swimming Pool and Pool area with an abundance of tables, seating and lounges for vacationers use, a private walkway to the beach and stairs down to the beach. Guest may also enjoy the large oceanfront dune deck for sitting, reading, sunbathing or cocktails while taking in the views of the family and friends at play on the beach, views of our North Carolina Outer Banks coastline, distant views of the Kitty Hawk Fishing Pier and the Army Research Pier in Duck, lets not forget the view of the waters of the Atlantic Ocean with boats and fishermen that may be seen off shore, the occasional dolphin or porpoise swimming by or the seagulls and pelicans as they glide over head. At night you may watch the stars in the night sky over the Outer Banks, the kids chasing the sand crabs on the beach and listen to the sweet sound of the Atlantic Ocean as its waters wash up on the beach. 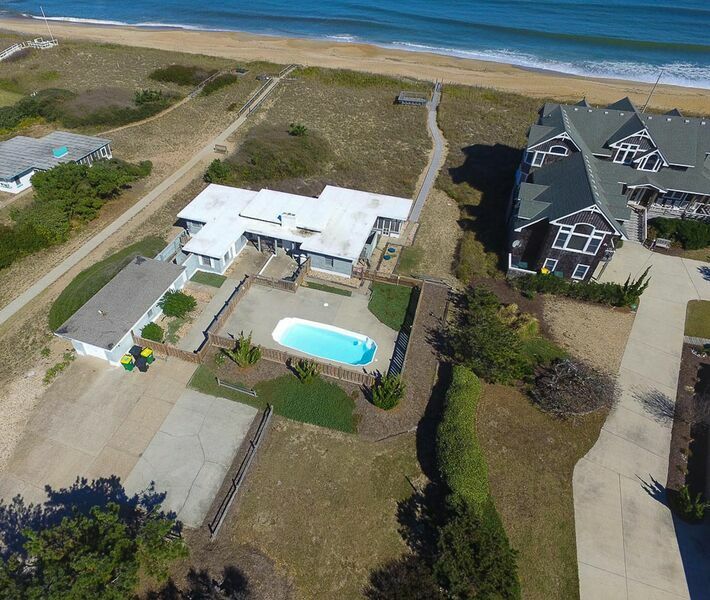 For those safety-conscious vacationers, this rental house is next to a lifeguard stand with the lifeguard service being provided by the Outer Banks lifeguard service company of Surf Rescue. There are two other beach lifeguard stands on the Outer Banks beaches within the Town of Southern Shores and two additional lifeguards that patrol on four-wheel drive ATVs. One of the favorites of many of the Outer Banks vacationers are the outdoor showers that are available at most rental houses on the Outer Banks. Unlike most rentals, this oceanfront beach rental has 2 outdoor showers for vacationers’ use! One of the outdoor showers has direct access for vacationers coming from the beach with direct access from the beach walkway into the shower and then an entry door to the southerly most bathroom and the rest of the rental house. Vacationers may also enter and exit this rental through the screened porch as they go to and from the beach, dune deck, swimming pool, and outdoor shower. The screened porch is on the Atlantic Ocean side of the rental and is furnished with a love seat (glider), chairs, picnic table, benches and an outdoor carpet has been installed for the comfort of the vacationer’s feet. Within a stroll or bike ride down the pedestrian path are a variety of Outer Banks Restaurants (Coastal Provisions Wine and Oyster Bar, High Cotton, Run Down Café, Duck Donuts, Pizza shops, Subway, Vilai Thai Kitchen, bagels and other restaurants as you head south into Kitty Hawk (Ocean Blvd, Black Pelican, etc. ), Kill Devil Hills and Nags Head (you will likely prefer to drive or take another form of OBX transportation). You may want to also venture north to the villages of Duck & Corolla and other communities in Currituck County, commonly referred to as the Northern Outer Banks. For individuals participating in an Outer Banks Wedding, wedding attire can be arranged for and obtained at By the Sea Wedding Boutique conveniently located in the Southern Shores Crossing shopping center approximately one mile south of this rental. Main house with central heat and A/C. Detached building with window AC.